Venice has more than 400 bridges in diversified styles and sizes, among which there’re only 4 across the Grand Canal: Rialto, Ponte dell’Accademia, Ponte degli Scalzi and Ponte della Costituzione that was newly built in 2008. Rialto is the most famous old bridge, a symbol of Venice, the original trade center.Shakespeare mentioned it in his play, Merchant of Venice, and made the Rialto Bridge well-known in the world. Today it becomes one of the most popular places for tourists. Near the hotel where Mr.T and I lived, there’s Ponte dell’Accademia. Located in the southern end of the canal, it was firstly structured in steel in 1854. After demolished, it’s replaced by a wooden bridge twice. 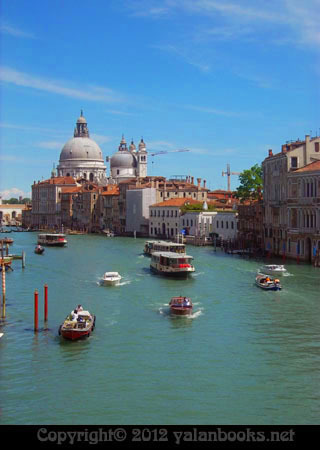 By the way, when you stand on the bridge, the view of the Grand Canal is really amazing! Ponte degli Scalzi and the new bridge Ponte della Costituzione are quite close, near the train station of Venice. The modern style of the new bridge has been criticized a lot, because of the lack of wheelchair access, lack of necessity and its style being incompatible with Venice’s medieval architecture. No matter what, it’s still there, above the Grand Canal with its shining steel armor. Let’s talk about it someday when its game is over.